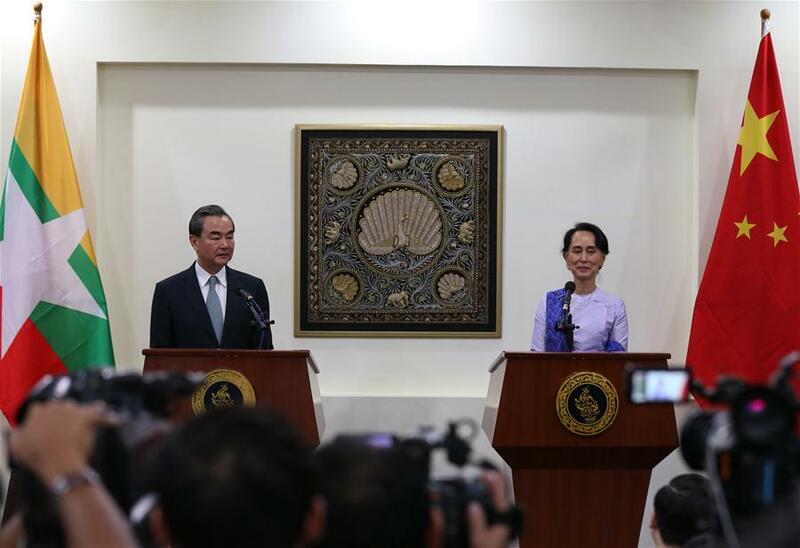 NAY PYI TAW, Nov. 19 (Xinhua) -- Chinese Foreign Minister Wang Yi said here on Sunday that China proposed a three-phase solution to help settle the issue in Myanmar's Rakhine state. Thus China proposes a three-phase solution, he said. The first phase is to achieve a ceasefire so that local residents can no longer be displaced. Through joint efforts, the ceasefire has been in place, Wang said. Second, the international community should encourage Myanmar and Bangladesh to keep communication in a bid to find a feasible solution to the issue, he said. The two countries have reached an initial agreement on repatriation of refugees fleeing to Bangladesh from Myanmar. The third phase is to find a long-term solution. Stressing that poverty is the root cause of turbulence and conflict, the Chinese foreign minister called on the international community to support poverty alleviation efforts in Rakhine state. Development can lead to stability, Wang said, adding that China's proposal has been backed by both Bangladesh and Myanmar. The Chinese foreign minister will participate in the 13th Asia-Europe Meeting (ASEM) foreign ministers' meeting to be held in Nay Pyi Daw on Nov. 20-21. He also visited Bangladesh and Myanmar.